Acting on a tip off, the personnel of 37th Battalion of the Sashastra Seema Bal (SSB), Mangaldai stationed at the border outpost in Samrang along the Indo-Bhutan border in Udalguri nabbed two drug peddlers on Saturday. 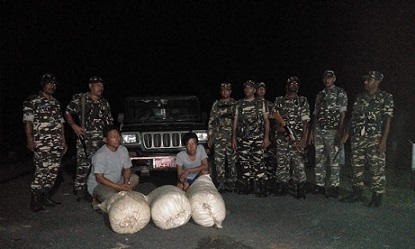 The SSB personnel also seized a huge consignment of 35 kg cannabis (ganja) along with a Bolero Pickup van registered in Bhutan near the Forest IB post in Samrang. The nabbed drug peddlers have been identified as Lekjay and Meto Tshering. As per reports, both of the nabbed drug peddlers are Bhutan nationals. The consignment was transported from Bhutan side and was supposed to be delivered in the Udalguri district. The seized items have been later handed over to the Dimakuchi Police Station in Udalguri district for further legal action. Meanwhile, the Dimakuchi police have prepared to hand over the Bhutan nationals and the seized items to Bhutan police, informed in-charge of Dimakuchi Police Station, Maheswar Sarmah.